he primary industry during Hoboken's days as an industrial capital was shipbuilding, but at various times the city was home to industries that created a litany of products that have since become household names: Lipton Tea; Maxwell House Coffee; Hostess. The Tootsie Roll, slide rule, zipper, and ice cream cone all were born in Hoboken. Hoboken is becoming more and more desirable for Manhattan-bound commuters. Hoboken's harbor was an important dock for German shipping vessels, and, thus, the boats arriving from Germany with immigrants. In 1890, around 40 percent of the city's population was composed of immigrants, over half of them from Germany. Yet when the United States entered World War I on the side of Britain and France, this all changed. The U.S. government seized control of Hoboken's piers and the German ships docked there. Martial law was declared in sections of the city, and many Germans were sent to Ellis Island. Thousands of Germans left Hoboken, and soon the city became known for its large Italian population. Meanwhile, the government made use of the docks, sending some two million U.S. soldiers through Hoboken's piers, to and from the war in Europe, where they were told to hope for "Hell, heaven, or Hoboken" by Christmas. The city's economy was devastated by the commercial freeze of its piers during World War I. Yet shipbuilding and the waterfront remained important, although increasingly Hoboken's shipyards developed a reputation for corruption. In 1948, Malcolm Johnson, a reporter for the NEW YORK SUN, wrote a series of stories about corruption, crime, and murder along the waterfront. Johnson won a Pulitzer Prize for the articles and six years later they were made into a Hollywood movie. Filmed almost entirely on location in Hoboken, Elia Kazan's ON THE WATERFRONT used actual longshoremen as extras. Hoboken native Frank Sinatra was nearly used for the starring role until Marlon Brando, Kazan's first choice, accepted the part at the last minute. It is said that Kazan hired a bodyguard for the filming and that thousands of dollars were siphoned away to pay off landlords and suspicious dockworkers. In the 1950s and 60s, the new importance of air travel and the development of containerized cargo, necessitating deep water ports, increasingly undermined the Hoboken waterfront, which fell into a state of disrepair. Many of Hoboken's industries moved away or closed up shop during this time, and the city was considered something of a post-industrial wasteland until the 1970s, when suddenly Manhattan-bound commuters began to take interest in Hoboken's generous stock of affordable brownstones and townhouses. In the 1990s, a major waterfront renovation project turned Pier A into a park, and Manhattan-based companies began to see the city as a viable alternate office location. Today, Hoboken's plethora of bars, restaurants, public transportation, and reasonably priced housing -- not to mention, as always, it's proximity to America's largest city -- render it a charming tassel upon the metropolitan bonnet of greater New York. 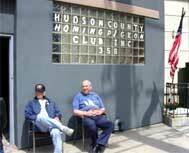 The Hudson County Homing Pigeon Club: Last of its kind. The Clam Broth House has been a Hoboken attraction since the days when its waterfront was bustling with ships.